In terms of percentage of real gross domestic product (GDP), the report explains that in 2016 U.S. energy prices were at their lowest levels since the EIA began tracking such data in 1970. It isn’t difficult to surmise what led to the dramatic decline in energy costs over that eight-year span. As EID recently highlighted, 2008 happens to be the year the shale revolution took hold across the United States. So it is no coincidence that energy prices reached record lows at the same time U.S. oil and natural gas production increased 77 and 32 percent, respectively, from 2008 to 2016. Just as impressively, recent EIA data show per capita carbon dioxide (CO2) emissions decreased 16 percent during that timespan. Economic growth and increased carbon emissions have historically gone hand-in-hand, but the United States has bucked the trend thanks to increased natural gas use. The following numbers tell the tale. All told, the United States has enjoyed significant economic growth, declining energy prices and declining greenhouse gas emissions since the shale revolution began. The collective data really couldn’t be much clearer: Increased natural gas use has proven to be a win-win for the economy and environment. 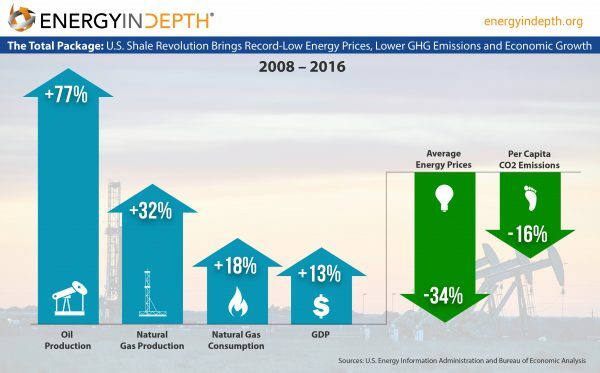 U.S. GDP has increased 13 percent from 2008 to 2016 at the same time that overall CO2 emissions decreased eight percent and natural gas consumption increased 18 percent. And though shale development’s most obvious contributions to America’s status as a world leader in economic growth and carbon reductions has been helping reduce power sector carbon emissions and driving electricity costs to record lows, shale oil development has also helped keep gasoline prices lower than they otherwise would have been, explaining why transportation costs have declined significantly as well. Though gasoline prices are influenced by a number of factors that are entirely out of the United States’ control — including global market prices and geopolitical events that have led to an uptick in prices this summer— the U.S. shale revolution has helped keep domestic gasoline prices far lower than many other regions of the world, and far lower than what they would be had the shale revolution never happened. This new EIA data showing energy costs are at their lowest levels since the Nixon administration adds to a growing list of fracking-related milestones that have been decades, rather than years, in the making: Per capita carbon emissions are at their lowest levels since 1950, net oil exports are at their lowest levels since 1958 and the United States is a net natural gas exporter for first time since 1957. These achievements can all be traced to the shale revolution, which continues to be a win-win for the U.S. economy and environment.